A poaching song from George ‘Pop’ Maynard of Copthorne in Sussex. The song was recorded for the BBC by Peter Kennedy in 1956, and made available on the 1976 Topic LP Ye Subjects of England; it’s also on To Catch a Fine Buck Was My Delight (The Voice of the People volume 18). I first heard it – I think – on Martin Carthy’s LP Crown of Horn; but would have heard Pop himself singing it on Ye Subjects of England not long after. And then I found the words and notation in a slim EFDSS pamplet, The life and songs of George Maynard (actually a reprint of Ken Stubbs’ article from the Journal of the English Folk Dance and Song Society, 1963) which I picked up at my first Sidmouth Festival in 1978. Traditional singers often conclude a song by saying “and that’s a true story”. Well this one really is. The song tells of the murder in August 1856 of sisters Caroline and Maria Back (19 and 17 respectively), by Dedia Bedanies, a private in the British Swiss Legion based at Shorncliffe Barracks near Folkestone in Kent. Bedanies was tried for murder and hanged at Maidstone gaol, January 1857. I learned this from George Spicer who, although he spent most of his life in Sussex, was actually born at Little Chart in Kent – just a few miles from my home town. He learned this song from his father-in-law, Sydney Appleton, of Lydden, Kent. George’s son Ron – another fine singer and an absolutely lovely man – also sang this song, and recorded it on The Keys of Canterbury, an album of Kentish material with which I was also involved – see Pete Castle’s website for details. In fact the song seems to have been well-known in Kent – perhaps as a warning to young girls. 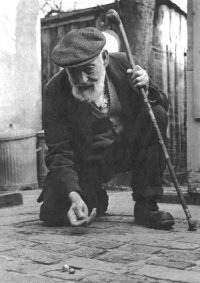 Charlie Bridger from Stone-in-Oxney had a full version, with very similar tune and words to George Spicer’s; Francis Collinson collected a couple of versions in Kent in the 1940s, but also found the song in Buckinghamshire and Dorset. 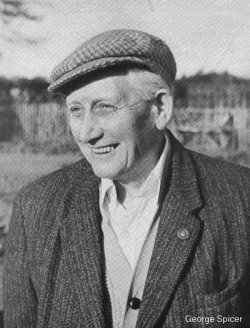 Truncated versions have been recorded from a number of Southern English Traveller singers, for example Charlie Scamp. You can read more at http://folkopedia.efdss.org/Folkestone_Murder,_The although if you want the full story of the murder you probably need to get hold of George Frampton’s article in Bygone Kent Vol 13 No 1, January 1993. I learned the song from George Spicer’s Topic LP Blackberry Fold which has not to date been released on CD or MP3. But you can hear George singing the song on the Musical Traditions CD Just Another Saturday Night: Sussex 1960. Rod Stradling has described this song as “A horrible song, it seems to me, with few redeeming graces” but I’ve always had a soft spot for it. Not least because this was the song I sang when I won the first Sidmouth Singer competition, at the Sidmouth Festival back in 1984. This was a very proud moment for me – the competition was judged by Shirley and Dolly Collins, and the runners up Bill Prince and Barbara Berry were certainly no slouches as singers. 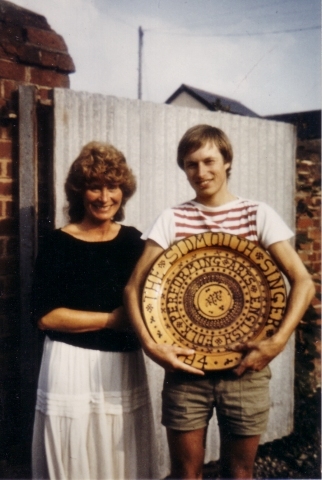 Since Vic Smith has a history of re-posting this lovely picture of my knees, I’ll get in first: here’s me with Shirley, and the enormous slipware plate which was my prize. It was the Steeleye Span album Below the Salt which turned me onto folk music, and there was a time when I could have sung all of the songs on that LP. Including the rather lovely final track, ‘Saucy Sailor’. The album sleevenotes say that their version is “from the Journals of the Folk-Song Society. Collected by George Butterworth in Sussex, 1907”. Now that we have access to George Butterworth’s manuscripts via the Take Six website, I must admit that I can’t identify which version Steeleye were using. Not that it matters; theirs is still a very good arrangement. In any case, I’ve moved on: about a dozen years ago I heard Vic Gammon singing a different Sussex version, and it prompted me to go looking to see what other variants I could find. This version was collected by Butterworth in May 1907, from a Mr. H. Webb at Stanton St.John in Oxfordshire, and I found it in the Journal of the Folk-Song Society Vol 4 (1913). There are four versions of the song published in that year’s Journal, two of which are from Butterworth. Neither the Journal nor Butterworth’s MS makes it clear from whom the published set of words was collected – from Mr Webb, or a group of children from Amberley in Sussex. I was originally tempted to replace the couplet “I’ll cross the briny ocean / Where the meadows are so green”, but ultimately decided to retain it. It doesn’t make sense, but I like the idea of a singer from Oxfordshire – about as far from the sea as you can get in England – having a rather confused idea of what the sea was actually like. You can see all of the versions of this song which Butterworth collected (listed under the title ‘Come my own one’) by following this link to the Take Six site. The largest single source of songs in my repertoire is almost certainly the Copper Family of Rottingdean in Sussex. So this is just the first of many. I think that the first time I heard this song was on the LP No Relation by Royston Wood and Heather Wood, and I suspect that I learned the song from Bob Copper’s book A Song for Every Season some time before I’d actually heard Bob and John sing it on the 4 LP set of the same name. That set was of course on Leader Records so, like the rest of the albums on that label has, for reasons which are well-known (but none the less unfathomable and quite frankly unforgiveable), never been released on CD. You can however hear Bob and Ron sing the song on the excellent Topic CD Come Write Me Down.